Carlton finished 3rd with 16 wins, 4 losses and a draw. Geelong took the premiership after being undefeated all season. Games: Played 24. Won 17, Lost 6, Drawn 1. Goals For 69 Against 23. Home Grounds. Royal Park, M.C.G., East Melbourne C.G. Carlton Annual General Meeting at The Clyde Hotel. "....the continued success and prosperity of this club, now arrived at it's 14th. anniversary, and it is gratifying to remark that it again emerges from it's retirement with the proud insignia of the "Premiership" inscribed on it's banner." 165 matches; Won 84, Drawn 64, Lost 17. Goals For; 259 Against; 69. Played 74 matches; Won 26, Lost 27, Drawn 21. 1878. First time behinds recorded, but not used in scoring as only goals counted. Behinds would not be counted in the scoring system until the formation of the V.F.L. in 1897. Before the commencement of the 1878 season the club was told by the University that the Madeline Street reserve was required for building purposes and had to be vacated immediately. Despite the University's view that football could not be played "within the sacred precincts of the University," the Hotham club was given the best surfaced ground in the city which was financed by the Carlton Football Club and it's supporters. "Fair Play" writing to The Argus (Friday 31st. May) objects at Carlton's removal from Madeline Street and the fact that the hurling club were now charging admission, which was one of the reasons the University evicted Carlton. Carlton returned to Royal Park for some of it's home games. Carlton sought approval from the Melbourne City Council to use 11 acres in the southern end of Princes Park. This was granted provided that no trees were to be removed, no fences erected and no charges for admittance. Portable fences for crowd control allowed. The Melbourne City Council could revoke these arrangements at any time. Melbourne Football Club could charge admittance and intended to split the takings of the Melbourne-Carlton game with the M.F.C. and the Melbourne Cricket Club, to which Carlton objected. The M.F.C. relented and shared the takings with Carlton. "The Footballer" said of George Coulthard "As a follower, he is unequalled for activity and endurance, and when played in defence his coolness, dodging and long kicks render him invaluable." 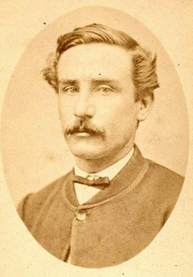 Other leading players for the Blues in 1878 were Michael Nash (grandfather of of South Melbourne's Laurie Nash), "Topsy" A. E. 'Topsy' Waldron *, and J. Melville. Carlton vs Waratah matches at the M.C.G. Saturday 29 June (Rugby) and Monday 1 July (Australian Football) 1878. E. Barrass, L. Bracken, G. Brendell, G. McGill, J. Melville and R. Sidley did not play in the game under rugby union rules (15 aside). 1878. Premiers. Geelong, 2. Melbourne, 3. Carlton, 4. Hotham. NB # East Melbourne C.G. located west of the MCG., west of Jolimont Road. Originally Essendon's home ground prior to Windy Hill. Taken over by the Victorian Railways in the 1920's and used for the extension of rail yards. Now part of a housing development. NB * "Topsy" A. E. 'Topsy' Waldron . Born Mornington Vic. 1857 moved to Melbourne with parents. Joined junior club Montague, the Albert Park club, and then the Carlton Football Club. A. E. 'Topsy' Waldron moved west to Adelaide and played with Norwood Football Club 1879-1890 winning 8 premierships. Won - 4 goals (Henry 2,Coulthard, John Rickards) to Nil. May 11.- At Royal Park; v Hotham United (20-25). Won- 2 Goals (John Rickards) to Nil. May 18. - At East Melbourne C.G; v Hawthorn (20-25). Won - 7 Goals (John Rickards 2,Coulthard, Gardiner, Henry, Nudd, G.Robertson) to Nil. May 24. - At Sale; v Sale. Won - 7 Goals (Gardiner 2, Henry 2, Coulthard 2, Smith 1) to Nil. May 25. - At E.M.C.Ground; v Essendon. Won 3 Goals (Bracken, Goer, Henry) to Nil. June 01. - At S.M.C.Ground; v Albert Park. Won - 3 Goals (Murphy, Henry, Coulthard) to 1. June 08. - At M.C.G; v Melbourne. June 15. - At Richmond Paddock; v St.Kilda. Won - 5 Goals (Coulthard 2, Henry 2, John Rickards) to Nil. June 22. - At M.C.G; v Hotham. Won - 2 Goals (L. Bracken, James Rickards) to 1. June 29. - At M.C.G; v Waratah (N.S.W.) Rugby Rules. Drawn - 1 Goal each. July 01. - At M.C.G; v Waratah (N.S.W. ); Victorian Rules. Won - 2 Goals (Gunn, Turnbull) to 1. July 06. - At E.M.C.Ground; v West Melbourne. Won - 3 Goals (Coulthard 2, Sutherland) to Nil. July 13. - At E.M.C. Ground; v Melbourne. July 20. - At E.M.C. Ground; v Barwon. Won - 2 Goals (Coulthard, Henry) to Nil. July 27. - At E.M.C. Ground; v Albert Park. Won - 2 Goals (Henry, Barrass) to 1. Aug. 03. - At E.M.C. Ground; v Ballarat. Won - 6 Goals (Coulthard 2, Nash, Gunn, Goer, Murphy) to 1. Aug. 10 - At Essendon; v Essendon. Won - 3 Goals (Henry 2, Coulthard) to 1. Aug. 17. - At Williamstown; v Williamstown (20-25). Won -2 Goals (Jas. Rickards, Henry) to 1. Aug. 24. - At Melbourne; v Melbourne. Lost - 2 Goals to Nil. Aug. 31. - At St.Kilda; v St.Kilda. Won - 6 Goals (John Rickards 2, Coulthard, Murphy, Smith, Goer) to Nil. Sept. 07. - At Royal Park; v Fawkner and South Yarra Standard combined. Won - 5 Goals (Coulthard 2, John Rickards, Goer, Gardiner) to 1. Sept. 14 - At Geelong; v Geelong. Sept. 21. - At Royal Park; v South Melbourne (20-25). Drawn 1 Goal (Ford) to 1. Sept. 28 - At Melbourne; v Melbourne. Matches played 24; Won 17, Lost 5, Drawn 2. Goals scored 70, Against 23. G. Coulthard 18, J.Henry 14, John Rickards 10, J. Gardiner 4, W. Goer 4, B.Murphy 3, G.Smith 3, L.J.Bracken 2, F.Gunn 2, Jas. Rickards 2, J.A.Turnbull 2, E.Barrass, A.Ford, T.Nash, Henry 'Harry' Nudd, G.Robertson, and J.Sutherland 1 each. May 11. v North Carlton (25) Lost - 2 Goals to 1. May 18. v Carlton United. Lost - 3 Goals to 2. June 01. v Lincoln United. Won - 1 Goal to Nil. June 15.v Adelphian. Draw - 1 Goal each. June 22.v Hotham Second. Won - 2 Goals to Nil. July 06. v Albert Park Second. Won - 2 Goals to Nil. July 20.v Melbourne. Draw - No Goals scored. July 27.v North Geelong. Won - 2 Goals to Nil. Aug 10. v Albert Park. Draw 1 Goal each. Aug.17. v Essendon. Lost - 1 Goal to Nil. Aug 31. v Melbourne. Lost - 2 Goals to Nil. Sept.07. v Star of Carlton. Lost - 1 Goal to Nil. Matches Played 12, Won 3, Lost 6, Drawn 3. Goals Scored 10, Against 13. T. Knowles 6, Wishart, Browne, Long, and Lewis 1 each. 1878 Carlton teams published in The Argus. Some team details are missing, if anyone has them could they please contact Blueseum. 1878 was Essendon's first season as a senior club. "The committee of management of the Carlton Football Club meet this evening, at Elliott's Clyde Hotel Carlton, to arrange preliminaries for the annual general meeting, to be held on the 26th. April. The Argus reports that the new edition of The Footballer has just been released. The report mentions that there are 5 senior clubs, 8 public school clubs, 27 juniors, and 44 country clubs in Victoria. All members of the Carlton Club met to practice the rugby game which they played in June against the Waratahs. Sir: - What is the difference between Hurling and Football? or, rather, why are Hurling Clubs allowed to charge admission to the Madeline-street reserve and not football clubs. I hope the council of the University will take this matter in hand and stop this fraud. Carlton F. C. AGM held at the Clyde Hotel, Carlton. More than 100 members attended. "It is with much pleasure your committee have to record the continued success and prosperity of this club, now arrived at it's 14th. anniversary, and it it gratifying to remark that it again emerges from it's retirement with the pround insignia of the "Premiership" inscribed on it's banner. The First Twenty have played 21 matches, out of which the old club have scored 14 wins, drew 4, lost 3, - 1 each to Melbourne and Barwon, and 1 to Waratah at the Rugby Union game. 56 goals were kicked and 11 lost, making in all since the club's formation the grand total of 165 matches played, 84 of which were won, 64 drawn, and 17 lost, 259 goals kicked for, and 69 against. Of the goals scored during the past season Messrs. Henry with 9; G. Coulthard and W. Bracken with 8 each, and L. Bracken with 7 are worthy of the members congratulations. Despite all the encouraging efforts put forth on their behalf, the members of the second twenty have had another indifferent season, and seem after a few matches are played to grow very lethargic. Since the institution of this division 74 matches have been played, 26 won, 21 drawn, 27 lost, 71 goals kicked and 83 lost. The most interesting feature of the season was the intercolonial club contest was against the Waratahs in Sydney, and the pleasure and satisfaction of it's outcome. Your committee regret having to state that the Roman Catholic Collegiate Reserve in Madeline-street, has been summarily closed to them, for reasons wholly unexplained. Efforts have been put forth to induce the city council to grant the club a potion of Princes-park as a playground. In the cause of charity it is gratifying to observe that the game has become a sympathetic medium, for no less than the sum of £316 17s 5d ($633.75) has been devoted to benevolent purposes during the past three seasons. In accordance with the club's annual custom, Messrs. G. W. Robertson and W. Goer (by priority of claim) are to be presented with illuminated addresses, and Messrs. Brendell, and Knowles of the Second Twenty, with gold lockets. The coming season bids fair to be full of interest; The Queen's Birthday match will be played at Hamilton against the combined forces of the Western District. The usual matches with Geelong and Barwon are listed, and the intercolonial club matches the Waratahs are arranged for the 29th. June and the 1st. July at the Melbourne Cricket Ground." Patrons, His Worship the Mayor of Melbourne, Hon. James Munro MLA, Mr. J. Curtain J.P., and Mr. E. Latham. Vice Presidents: Messrs. A. Gillespie, J. H. Guy, and J. Macgibbon. Vice Captain: Mr. G. M. Robertson. Hon. Secretary: Mr. J. A. Turnbull. Hon. Treasurer: Mr. T. P. Power. Hon. Secretary Second Twenty: Mr. E. T. Walters. Delegates to the Association: Messrs. Power and Turnbull. Committee: Messrs. J. Gardiner, O'Brien, Henry, Prevot, Coulthard, Nudd, Williams, Murphy and A. Kennedy. The presentations were then made, and included a gold locket, presented to Mr. G. Coulthard, as mark of esteem and respect entertained by a few admiring members. Votes of thanks were recorded to Messrs. Robertson and Power for the enthusiasm displayed on the club's behalf. Members will meet this afternoon for pratice at Royal Park. Carlton played an Excelsior 25 on Royal Park at 2.30pm. Future Carlton player C. Nudd played for Excelsior. Barrass, L. Bracken, W. Bracken, Coulthard, Gardiner, Goer, Gunn, Henry, Ford, J. Kelly, Murphy, McGill (Capt. ), Nudd, Nash, G. Robertson, James Robertson, J. Rickards, Rickards, Smith, Turnbull, Waldron and Melville. Goals; Henry 2, Coulthard, John Rickards. Players mentioned; McGill, Gardiner, Coulthard, John Rickards, Henry. A letter to the editor of The Age about the Madeline Street Ground. The Waratah Football Club of Sydney have accepted the challenge of the Carlton Football Club to play matches in Melbourne on June 29 and July 01. At the request of the Carlton Football Club these matches will have the patronage of the V.F.A. "The Carlton Football Club, through some unexplained action on the part of the committee of the Roman Catholic collegiate reserve, Madeline-street, is at the commencement of the season is in the unpleasant predicament of being without, a playing ground." Carlton had donated gate takings to the Melbourne Hospital and had incurred considerable debts for ground improvements. An application has been made to the Melbourne City Council for permission to play on the southern portion of Princes Park. This application has been accompanied with a petition signed by 4,000 of the ratepayers and other residents of the city and suburbs. In a letter to The Argus on May 31, the writer "Fair Play", informs that a hurling match was played on the Madeline Street ground on Saturday May 25 and that the spectators were charged for admission. "Fair Play" would like to know why a distinction was made in favour of hurling. McMichael and Monie two of the best players from last season, have defected. The Waratah Football Club has accepted the challenge of the Carlton Club to play a match in Melbourne on the 29th June and 1st July. Carlton played Hotham United (25) at Royal Park. Hotham United are one of the prominent junior clubs. Crowd; Between 1,000 - 3,000. Barrass, W. Bracken, Coulthard, Ford, Gardiner, Goer, Gunn, Henry, J. Kelly, McGill (Capt. ), Melville, Murphy, Nash, James Robertson, G. Robertson, J. Rickards, Rickards, Smith, Turnbull, Waldron, and L. Bracken. Players mentioned; (14) Coulthard, Bracken, Henry, L. Bracken, Melville, Nash, George Robertson, John Rickards, McGill, Smith, Kelly, Murphy, Goer, Guy. Carlton Reserves/Second Twenty played North Carlton (25) at Royal Park. Carlton will meet at the Clyde Hotel at 2pm. The South Australian Advertiser says (W) Bracken, "one of the finest of the Carlton players" will be playing for Norwood today against the local Adelaide team, The Victorians. Carlton played a Hawthorn 25 at the East Melbourne C.G. It seems that this game was not played on the usual rectangle. "The goal posts, over 20 feet in height, were placed north and south, the distance between them being about 160 yards, and the playing surface a circle of that diameter." The Carlton players, prior to the game, met at the Athletic Hotel at 2pm. Crowd; 2,000, well attended despite the charge of 6d (5c) for admission. A lot was expected of Hawthorn as last week they defeated Melbourne. The ground was in very good condition, Carlton won the toss and kicked to the southern goal. Henry scored the first goal after five minutes of play and fifteen minutes later J. Rickards kicked the second. G. Robertson, Coulthard and Nudd scored another three before half time. Hawthorn only had the ball on their forward line once in the first half. J. Rickards and Gardner scored the two second half goals. Barrass, L. Bracken, Coulthard, Ford, Gardiner, Gunn, Goer, Henry, J. Kelly, McGill (Capt. ), Murphy, Melville, Nash, Nudd, G. Robertson, James Robertson, J. Rickards, Rickards, Smith, and Turnbull. Goals; John Rickards 2, Henry, G. Robertson, Coulthard, Nudd, Gardiner. Players mentioned; (11) Melville, McGill, Coulthard, Waldron, Henry, Gunn, John Rickards, George Robertson, Nudd, Turnbull, Gardiner. Carlton Reserves/Second Twenty played Carlton United in Royal Park. Amess, Bell, Byrne, Henry, Hogan, Ilman, Killigrew, Knowles, Knowles, Lewis, Long, Moody, Moore, McAinsh, Robin, Spencer, Sidley, Sutherland, Turnbull, Walters, Wishart, Woods. This match did not come off as Carlton played in Sale on Queen's Birthday Friday 24 and then they met Essendon on the E.M.C.G. on Saturday 25 May. Carlton played the Sale Football Club (22) at the Sale Cricket Ground. The players gathered at the Athletic Hotel Swanston Street at 2.30pm Thursday prior to departure. Carlton was entertained at lunch at the Royal Exchange Hotel and driven to the ground in coaches. The Blues dominated a very one sided match. Bullen, a Sale player, fractured his collar bone. One observer wondered if the Sale players had ever seen a football game. The Sale team was to comprise of 25 players, however some men failed to show, and with substitutes a 22 man side was cobbled together. The Blues attended after match entertainment, and returned to Melbourne on the evening train. Barrass, Bracken, Coulthard, Ford, Goer, Gardiner, Henry, Murphy, Melville, McGill (Capt. ), G. Robertson, James Robertson, Smith, Turnbull, Waldron, Petherick, Brendall, Lewis, Sidley and O'Brien. Barrass, Bracken, Brendall, Coulthard, Ford, Gardiner, Goer, Henry, Lewis, Melville, Murphy, McGill (Capt. ), Robertson, Robertson, Prevot, Petherick, Prunty, Smith, Wishart, Waldron. Goals; Gardiner 2, Henry 2, Coulthard, Smith, Barrass. Players mentioned; goal scorers only. On SATURDAY, MAY 25, Admission 6d. "From the number of matches arranged to be played on cricket grounds and the large gatherings at those already played, the cricket and football clubs are likely to put money in their purses, and I wish them success. I scarcely suppose the coffers of many of the clubs are overflowing with the results with of last cricket season's takings at the gates, so that the addition to the club's funds during the winter months will doubtless be very welcome, and football clubs, as a rule, are not very wealthy, so a little gate money will not be unacceptable to them. As there seems little prospect of football grounds at present, I am only sorry that the cricket and football seasons are not so arranged that the grounds could be used in summer for the one and winter for the other, for then football could be seen with some degree of pleasure, and not with its present noncomitants of jostling, crushing, and neck straining to get a decent view, the encroachments of spectators, and other luxuries too numerous to mention." In 1878 the South Melbourne Cricket Ground was first used for football. In 1931 the Sporting Globe published the history of the South Melbourne Football Club written by A. E. "Buck" Wheatley an early administrator, and he enabled football to be played on the ground. Carlton had four games this season fixtured against Melbourne. As the Blues did not have a home ground, the Melbourne secretary published that the games would be played at Melbourne, and that Carlton would not have a problem with this arrangement. On hearing entrance fees will be charged, Carlton wanted to know how they will be distributed. They were told that they would be equally divided between the Melbourne Football and the Melbourne Cricket Clubs. Carlton advised them, that if the match was to be played on the cricket ground, then the gate money should be divided between the two clubs and the cricket club whose ground it is. Unless a fair and equitable distribution of funds are adhered to, Carlton will decline to play on the M.C.G. and arrange matches on other grounds, or with other clubs. Carlton are waiting for Melbourne's response. "...in view of the financial positions of the clubs-Carlton with debt, and Melbourne with none, to say nothing of the inequities of the case-I cannot see how Melbourne can justly maintain the attitude she has taken up." Carlton played Essendon at the East Melbourne Cricket Ground. Essendon had been a junior team from their formation and the Carlton Second Twenty had played them in their very first game. This year the V.F.A. had elevated Essendon to senior club status. In last year's match Essendon, as a junior club, were allowed to play with 25 players. This is the first meeting between Carlton & Essendon as senior V.F.A. clubs. Carlton won the toss and the match commenced late at 3.30pm. The late start upset some of the paying public. Essendon's first effort on even terms was creditable. Carlton should have scored at least nine goals had they kicked straight. Players mentioned; (10) Henry, Nudd, Bracken, Turnbull, Goer, Coulthard, G. Robertson, Murphy, Gardiner, Melville. The Melbourne City Council had received a petition from rate payers urging the council to provide land for the Carlton Football Club in the southern part of Princes Park. Alderman O'Grady objected on the grounds that the 11.5 acres was too close to the cemetery and may upset visitors and funeral services. "That the use of the park be granted to the Carlton Football Club for the winter season." Alderman Gatehouse seconded the amendment. Fast forward 137 years to December 2015. This hand written and signed by more than 3,500 ratepayers' petition has been unearthed in the Public Records Office in North Melbourne. "Sir, - Having read in your columns some time ago that the council of the University had refused the request of the Carlton Football Club for permission to play on the Madeline-street reserve either for pecuniary benefit or otherwise, I was very much surprised on Saturday last to find that the hurling clubs were playing a match on the same ground, and were charging for admission. I think that this is very unfair to the Carlton Football Club, who have made nearly all the improvements there. I should like to know the reason why they make a distinction in favour of hurling." - I am, &c, FAIR PLAY. Carlton played Albert Park on the South Melbourne Cricket Ground. Following the Melbourne and Carlton clubs playing on cricket grounds, the Albert Park club has arranged matches on the South Melbourne Cricket Ground. Admission was 6d. (5c), cab fares from Swanston Street to the ground, 3d. The Carlton team were on the ground at 3pm sharp looking full of confidence eager for the fray. On the other hand it was the opposite for the Alberts as they straggled onto the the arena, not looking forward to playing in "half a gale of cold wind from the south." McGill won the toss and the Blues kicked with the wind and had the better of the play in the first half. In the second half the game was fairly even. The Blues preffered to run with the ball, where as The Alberts relied on their kicking. Barrass, Brendall, Coulthard, Ford, Gardiner, Goer, Henry, J. Kelly, Melville, Murphy, McGill (Capt. ), Nash, Nudd, G. Robertson, James Robertson, Smith, Turnbull, Waldron, J. Rickards, Rickards. Players mentioned; (13) Barrass, Goer, G. Robertson, Gardiner, Coulthard, Waldron, McGill, Rickards, Smith, Nudd, Turnbull, Henry, Murphy. Amess, Bell, Brown, Henry, Hogan, Illman, Knowles, Knowles, Killigrew, Lewis (Capt), Long, Moody, McAinsh, Petherick, Sidley, Sutherland, Turnbull, Spencer, Walters, Wishart, Woods. G. Coulthard umpired the match the First Twenties of the Medical School (University) and Scotch College played on the Est Melbourne Cricket Ground. "Mr. G. Coulthard gave universal satisfaction as central umpire." The dispute between Carlton and the Melbourne Football and Cricket Clubs over the distribution of gate takings has been settled. The takings will be divided equally between the three clubs. The application for Carlton, which is supported by a petition of 40 yards of ratepayers signatures, to play in Princes Park will come again before the City Council next Monday. The main objection being the closeness of the ground to the cemetery. Crowd; in excess of 5,000. The Blues were favourites, as the Reds had been beaten in their last three matches by junior teams. But Melbourne had learnt from the last time they played Carlton. The Reds outplayed the over confident Blues. The match began at 3.15pm, due to the late arrival of some Melbourne players. McGill lost the toss and the Blues kicked to the southern end. Carlton's kicking and marking was as good as their opponents, but they lacked the dash of Melbourne. Barrass, Brendell, Coulthard, Ford, Goer, Gardiner, Henry, James, J. Kelly, Murphy, Melville, McGill (Capt. ), Nudd, Nash, James Robertson, G. Robertson, J. Rickards, Rickards, Smith, Turnbull and Waldron. Players mentioned, (14) Coulthard, Goer, George Robertson, Henry, Barrass, Nudd, Murphy, Turnbull, McGill, A. E. 'Topsy' Waldron, J. Kelly, James Robertson, Gardiner, Smith. Best; Coulthard (BOG), Goer, Nudd, Murphy, Turnbull, James Robertson, McGill. The Melbourne City Council gave the Carlton F.C. permission to play it's matches at Prince's Park provided that no fences be erected and no charges for admission. The club wanted to erect a 7 foot high fence around the ground, but the council would not hear of it. Permission will be granted to erect temporary fencing to keep the crowd from the playing arena. "The City Council on Monday last granted the use of 11 acres of the southern portion of Princes-park, which was the piece they applied for, to the Carlton Club, "on the condition that no fences be erected, no fees charged, that the club should be responsible for any trees destroyed, and that the council should have power at any time to revoke the present arrangement;" and on the principle that "half a loaf is better than no bread" I am heartly glad of it. I presume no objection will be offered to the placing of moveable hurdles around the playing space during the game, to keep the crowd back, as these will not come under the designation of "fences;" otherwise the permissive occupancy would be of small value. As no fees are to be charged, the offertory-boxes can come into requistion again to reimburse the club any necessary outlay in improvements. "There was a very long discussion in the City Council this afternoon (Monday 10) upon the subject of granting a portion of Prince's Park on the Sydney road, to the Carlton Football Club, for a playground. The Health Committee had recommended that the application be not acceded to, on the ground that the land was very near to cemetery, funeral processions would be disturbed by the noise, and a motion had been moved that the reason give by the health committee was insufficient, and that the application be granted. The Council decided at last to let the Football Club have the ground on condition that they did not damage the trees in the park, put up fences, or make a charge for admission." Carlton was due to play St.Kilda on the East Melbourne C. G.
Due to E.M.C.G. being waterlogged and unfit for football, the match was moved to the Richmond paddock. A one sided match, St.Kilda only had the ball in their attacking area twice. The Blues played up the hill in the first half. The many trees, in, and near the play ground, were not condusive for good football. Bracken, Coulthard, Ford, Goer, Gardiner, Gunn, Henry, J. Kelly, Melville, Murphy, McGill (Capt. ), Nudd, Nash, G. Robertson, James Robertson, J. Rickards, Rickards, Smith, Turnbull and Waldron. Goals; Coulthard 2, Henry 2, John Rickards. Players mentioned; McGill, Gardiner, Rickards, Goer, Coulthard, Henry, Smith, Gunn. Best; Coulthard (BOG), Smith, Goer, Gunn, Gardiner. Carlton Reserves played Adelphians at Royal Park. Carlton played Hotham at the Melbourne Cricket Ground. The game began at 3pm with Carlton kicking to the western goal. The Blues played the better football for the first two thirds of the match. Hotham over played the little mark instead of kicking the ball long. The game became quite tense in the second half and the Blues defence had their hands full preventing "the stripes" from drawing the game. Brendell, Coulthard, Ford, Goer, Gunn, Gardiner, Henry, J. Kelly, Murphy, Melville, McGill (Capt. ), Nash, Nudd, G. Robertson, James Robertson, J. Rickards, Rickards, Smith, Turnbull, Waldron, L. Bracken and Sidley. Best; Gunn (BOG), Murphy, Nudd, Goer, G. Robertson, James Robertson, L. Bracken, Turnbull. Carlton Second Twenty/Reserves played Hotham Second Twenty/Reserves at Royal Park. The Melbourne City Council gave permission for the Carlton F.C. to erect temporary fencing at Princes Park, but the posts are not to be sunk into the ground. Both the Carlton and Waratah clubs practiced for their match on Saturday at the Madeline Street ground. Carlton played the Waratah rugby club from Sydney at the M.C.G. This match was played under Rugby Union rules. The playing area was a rectangle 120 yards by 100 yards, the goals were 18ft. apart with a cross-bar 11 ft. from the ground. The Weekly Times said the rugby ground was 120 yards x 60 yards as compared with 200 yards x 150 yards for the Australian game. The Waratah club players were light, fast men who could cleverly dodge. Scrimmage followed scrimmage and in the first 10 minutes the ball was hardly kicked. The Blues enjoyed slingling the opposition in a manner that was illegal in the Australian game. Each side scored a goal and a touch down, but the Waratah captain Thallon, protested that the Carlton goal should not have been allowed. The Victorian umpire Mr. Tennent who was standing in front of the goals said it was a goal, and the Sydney umpire who was standing to the side of the goals said it went over the post. The Argus editorial was amazed that the Sydney umpire should have given any decision at all. The Sydney Morning Herald says the Waratah can take little pleasure in such a win. They wanted one umpire to avoid such a circumstance, but the Carlton captain insisted on two. Smith scored the controversial goal, a drop kick from 50 yards. See Versus Waratahs at Rugby Union at top of page. G. Coulthard, W. Goer, Fred W. 'Paddy' Gunn, J. Gardiner (Capt. ), J. Henry, J/T. Kelly, B. Murphy, G. McGill, T. Nash, H. Nudd, G. Robertson, J. Roberston, G. Smith, John A. Turnbull, A. E. Waldron. J. Henry did not play. Backs; James Robertson, H. Nudd. Half Backs; G. Smith, J. Gardiner, Waldron. Quarter Backs; Coulthard, F. Gunn. Forwards; G. Robertson, T. Nash, J. Kelly, B. Murphy, W. Goer, G. McGill, J. Rickards, J. Turnbull. Result; Match loss/drawn; Carlton 1 goal (disputed), 1 touch down - Waratah 1 goal, 1 touch down. Players mentioned; (15) A. Arthur Waldron, W. Goer, G. Coulthard, F. Gunn, J. Gardiner, J. Turnbull, T. Nash, James Robertson, G. Smith, G. Robertson, Henry, J. Kelly, B. Murphy. H. Nudd & G. McGill also played. Best; A. E. "Topsy" Waldron played a splendid game back; G. Smith displayed a good amount of brilliancy as well as judgment in his efforts; J. Gardiner, G. Coulthard and W. Goer made some good runs; B. Murphy, J. Kelly and George Robertson were useful forwards. July 01 Monday, Separation Day, half holiday. Carlton played the Waratah rugby club at Australian Football on the M.C.G. Waratah colours; White knickerbockers, dark blue and red striped jersey, hose, and cap. Carlton colours; Dark blue knickerbockers, jersey and cap, blue and white striped hose. A fine, pleasant day and the turf was firm. Sidley took the place of Nudd. The Blues played with 18 men for the first half and with 19 for most of the second half after McGill's injury. Both Nash and Barrass were late for the start of the game. Former Carlton player W. 'Bill' Newing played for Waratah. Goals ran north - south about 180 yards apart. The game itself was interesting and exciting, and it's effect on the crowd could be judged by the constant hum of excitement, which ever and anon found vent in frantic burst, "like a noise of many waters", contrasting strongly with the indifference and apathy manifested at the Rugby game on Saturday." The Sydney Morning Herald reports that the playing surface was a circle about 180 yards in diameter, but also mentions corners in it's report. Not long after the commencement the Blues realised that they had a strong opponent. The play was very fast and the visitors were quite active, well exceeding expectations. They were very determined and not being familiar with the subtleties of the game was a disadvantage. However the Blues wasted many scoring chances. Coulthard was criticised in the report for playing for himself instead of the team. Just after half time, the Carlton skipper G. McGill fractured his thigh bone just above the knee. It was broken in a clash with a team mate James Robertson, and he was taken to the Melbourne Hospital. Melville received a cut near the eye. E. Barrass, L. Bracken, G. Brendell, G. Coulthard, W. Goer, J. Gardiner, Fred W. 'Paddy' Gunn, J. Henry, J. Kelly, G. McGill (Capt. ), J. Melville, B. Murphy, T. Nash, H. Nudd, James Rickards, G. Robertson, James Robertson, G. Smith, John A. Turnbull and A. E. Waldron. Players mentioned; (20) G. McGill, B. Murphy, John A. Turnbull, G. Coulthard, L. Bracken, J. Henry, W. Goer, J. Melville, J. Gardiner, E. Barrass, Fred W. 'Paddy' Gunn, A. E. "Topsy" Waldron, G. Brendell, James Robertson, T. Nash, James Rickards, George Robertson, G. Smith, R. Sidley, J. Kelly. After the match the Waratah Club were entertained at the Clyde Hotel in Carlton. "... songs and recitations (a local one by L. J. Bracken being especially well received) enlivened the proceedings." "that it was the opinion of his men that the Victorian game was a far superior one to theirs, it giving more opportunities for individual play, and that they would use their best endeavours to introduce it to New South Wales." On their return to Sydney the Waratah Club would secede from Rugby Union and become an Australian Football Club. The dangers of the popular game of football have once more been forcibly illustrasted by a most serious accident. I refer, of course, to the case of Mr. McGill, the unfortunate member of the Carlton Club, who had his thigh broken during the thick of play on the Melbourne Cricket Ground yesterday. Had the fracture been a compound one, as it fortunately was not, the injured player may have lost his life. As it is, however, I was happy to learn on inquiry at the Melbourne Hospital this afternoon that the fracture was reduced without much difficultly, and that the patient is progressing very well, and may be expected to be able to use the limb again in about six weeks." Peter Pindar's take on the Rugby match. The Australasian's Peter Pindar commented on the Rugby game between Carlton and Waratah. "The great event of Saturday last, and one that attracted between 6,000 and 7,000 people, was the match played on the Melbourne cricket ground, under Rugby rules, between the Carlton and the Waratah, of Sydney. A large number of footballers, both here and in other colonies, have always looked upon intercolonial matches as one of the great desiderata of the game, and with a view of making these practicable between Victoria and New South Wales (in which latter the Rugby game obtains) a meeting was arranged last year between the Carlton and the Waratah at Sydney, to give the dwellers there an opportunity of camparing the Victorian and Rugby games, one day being devoted to each, and another was arranged for this season, partly for a like reason and partly to return the kindly hospitality of the Waratah club. Any assimilation of the rules, however, seems as far off as ever, the Sydney people apparently being confirmed in their preference for the Rugby game, and I think it extremely improbable that the game will ever be acclimatised here, because, apart from the merits of the two games from a player's standpoint, it is imposible the cramped, monotonous character of the play under the Rugby rules could ever find the favour with the public that the fine, free, dashing style of the Victorian game undoubtebly does; and any that knows human nature must be perfectly aware that the crowds that throng to our football arenas are a great motive power in keeping our game a thing to be sought after by our youthful athletes, while the beggarly array iof empty benches that grace (?) a contest at Sydney are a great deterrent to the progress of the game there. The style of the game accounts for it, my masters! Seven thousand people wouldn't go to see a Rugby game to-day if it were repeated; so said those around me at least. These, however, were among the uninitiated in the mysteries of the Rugby game, and looked upon it as "a monotonous succession of scrimmages, relieved by a short run with the ball tucked under the arm, ending with the runner's head in the pit of an opponent's stomach, no kicking, no marking, no nothink." Which may be rather a summary way of putting it, but like most descriptions of its kind, not without a modicum of truth; for though the scrimmages were not so frequent as they sometimes are, the head-butting was too prevalent to be pleasant to look at, or to be considered good football." The Argus reports from Sydney, that the secretary of the Waratah club claims that Waratah won the rugby game by 1 goal and argues that if disputed by Carlton, the goal must go to Waratah until the matter is settled. Carlton played West Melbourne at the East Melbourne C. G.
J. Gardiner captaining the Blues in McGill's absence, won the toss and kicked to the northern goal. James Sutherland from the second twenty made his debut and scored a goal. In a one sided match, Carlton played pretty much as they liked and West Melboune held only one player in check, and that was Waldron. Brendell, Bracken, Barrass, Coulthard, Gardiner, Goer, Gunn, Henry, J. Kelly, Murphy, Melville, Nash, James Robertson, G. Robertson, Jas. Rickards, Smith, Sidley, James Sutherland, Turnbull, Waldron. Best; Smith, Coulthard, Goer, Gunn, Turnbull, Sutherland. Players mentioned; Gardiner, Goer, G. Robertson, Coulthard, Gunn, Smith, Kelly, James Robertson, Bracken, Waldron, Nash, Sutherland, Murphy, Turnbull. Carlton Reserves played Albert Park Reserves. The Carlton F. C. restated that they still claim the goal scored in the Waratah rugby match. Until the Waratah club can disprove the goal, then the Carlton club will hold that the match was drawn. The Blues met at the Athletic Clubs Hotel at 2pm. Crowd; 7,000 plus 3,000 outside the ground. There was very little wind, the turf was dry and firm. Gardiner won the toss and elected to kick with a slight wind to the northern goal. The Blues missed many easy scoring opportunities, while Melbourne made the most of theirs. There was some dispute about the Carlton appointed umpire Mr. Prevot, and play was delayed. The Argus report says that he penalised the Melbourne players more so than the Carlton side. Bracken, Brendell, Coulthard, Ford, Gardiner (Capt. ), Goer, Gunn, J. Kelly, Murphy, Melville, Nudd, Nash, J.Robertson, G. Robertson, J. Rickards, Rickards, Smith, Sidley, Turnbull and Waldron. Players mentioned; (20) J. V. Cooke, George Robertson, Rickards, Coulthard, Gunn, Turnbull, Goer, Nash, Smith, Bracken, Nudd, J. Kelly, Waldron, Gardiner, Murphy, Melville, Sidley, J. Robertson, Waldron, Turnbull. Best; Smith, Coulthard, Gunn, Turnbull, Nash, Goer, Gardiner and George Robertson. George Magill, of Carlton, one of its best footballer players, and a well developed man of over six feet in height, and of correspondingly powerful frame, had his right thigh bone completely broken, during a match, last Monday, against the Waratah club. The brave fellow bore his misfortune very heroically, and he was being conveyed to the hospital waved his farewell to football with undismayed cheerfulness, and when Dr. Black announced that the bone, the strength of which is well known, had sustained a clean fracture, there were few present who did not express, not only compassion for the plucky sufferer, but their regret that a young man should be so grievously maimed in pursuing an amusement. Another Carlton man, J. Melville, sustained a nasty kick in the eye, which laid bare the temple, and inflicted a second gash below the socket, fortunately without injuring the sight. A third man, belonging to the Waratah Club, writes the Bendigo Independant's correspondent, received a nasty injury to the muscles of the shoulder, and although he subsequently managed to go into the field and assist at goalkeeping, his arm was evidently temporarily disabled. Melbourne University's Roman Catholic collegiate, who refused Carlton the use of the Madeline Street ground at the start of the season, have allowed the first twenties of Hotham and Albert Park clubs to play there this day. The Irish game of hurling had been played there, and was allowed to charge spectators for admission earlier in the year. "As the Madeline-street reserve was occupied by the Hotham and Albert-park last Saturday, I suppose the prohibition extending to the former occupants has been removed by some benign influence; or have the knights of the shinty filled their coffers so full with gate money that they can hold no more, and are now determined that others shall share in the profits? If what I learn be true, the objections to the former occupants began on very high moral grounds, and ended with the almighty dollar and how it was to be divided." Carlton played the Barwon Football Club at the East Melbourne C.G. Barwon won the toss, and Coulthard kicked off to the southern goal at 3.15pm against the wind. Heavy rain occasionaly fell during the match. The rain made the ground too slippery for running, and the ball became too heavy for kicking. Players were falling over as they tried to run and kick the ball. The ground was covered with large puddles of water. Coulthard kicked a nice goal from a sharp angle in the second half. All proceeds were donated to George McGill who was injured in the Waratah match. Barrass, Bracken, Coulthard, Ford, Gardiner (Capt.) Goer, Gunn, Henry, J. Kelly, Melville, Murphy, Nudd, Nash, G. Robertson, James Robertson, Jas. Rickards, Smith, Sidley, Saxon, and Waldron. Best; Henry, Waldron, Coulthard, Smith, Murphy, Kelly. Players mentioned; (13) Coulthard, Smith, Murphy, Rickards, Waldron, Henry, Gardiner, Gunn, Ford, Kelly, Nudd, Waldron, Barass. Carlton Reserves/Second Twenty played Melbourne Reserves in Royal Park. Amess, Bell, Brown, Byrne, Drake, Hart, Henry, Hoggan, Ilman, Knowles, Knowles, Killigrew, Lewis, Long, McAinsh, Petherick, Prunty, Spencer, Sutherland, Walters, Waldron, Wishart, Woods. Peter Pindar reports that Carlton and Hotham are at loggerheads over their last encounter on the M.C.G. He does not explain what the difficulties are, but says there has been "an alleged breach of the third commandment on the part of some of the Hotham players" and "a lot of correspondance has been passed on the subject." Carlton has cancelled all arrangements with the Hotham club for the remainder of the season. Letters to the editor of the Australasian from both sides first by Hotham's Mr. McIndoe and later a reply by Carlton's J. R. Turnbull, hon-sec. stating each club's case. It seems to revolve around the field umpire's decisions in the game, and some of the Hotham players reactions to his umpiring. McIndoe says that some umpiring decisions determined the outcome of the game which Carlton won. Carlton's committee complained to the H.F.C. committee about the unsavoury nature of the game and improper use of language by Hotham players. It seems whenever these two teams meet, there is always some kind of trouble. Turnbull stated that Carlton never has any problems with any other teams. The committee urged the Hotham committee to resolve it. A reply was not received, and Carlton terminated all further games with the club. O'Brien took offence to the remarks and lodged a formal complaint to the Football Association. The Association found one Hotham player guilty and asked him to apologise to O'Brien, the other two were found not guilty. Carlton refused to alter it's stance on the matter. "The bitter feeling existing between them seems to render friendly games a matter of great difficulty, and will do so until a new generation of footballers arise." Carlton played Albert Park at the East Melbourne C.G. A fairly large crowd attended. A strong wind was blowing from goal to goal. The Blues kicked with the wind in the first half. Carlton veteran "Harry" Guy played. The Blues totally dominated the first half, but only mangaged one goal. Bracken, Brendell, Barrass, Coulthard, Ford, Henry, Goer, Gardiner (Capt), J. Kelly, Murphy, Melville, Nash, Nudd, G. Robertson, James Robertson, Jas. Rickards, Smith, P. Saxon, Turnbull, Waldron and Sidley. Players mentioned; (13) Coulthard, Bracken, Nash, Henry, Gardiner, Goer, Smith, Turnbull, Murphy, Guy, Barrass, Waldron, Nudd. Carlton Reserves/Second Twenty played North Geelong at the North Fitzroy Cricket Ground. Carlton played Ballarat at East Melbourne C.G. The ground was heavy and slippery. Ballarat could not muster a strong team. Carlton won the toss and the game commenced at 3pm. The Blues kicked with the aid of a strong wind which blew fairly hard in the first half. The Blues easily beat the Ballarat team. Bracken, Barrass, Coulthard, S. Ekins, Ford, Gardiner, Goer, Gunn, Henry, J. Kelly, Murphy, Melville, Nash, Nudd, Rickards, G. Robertson, James Robertson, Smith, Turnbull, Waldron. Goals; Coulthard 2, Nash, Goer, Gunn, Murphy. Players mentioned; (10) Waldron, Guy, Nash, Coulthard, Rickards, Gunn, Goer, Murphy, Ekins, Gardiner. Amess, Brown, Gordon, Hart, Henry, Hogan, Ilman, Knowles, Knowles, Lewis, Long, Nudd, Petherick, Prunty, Sidley, Sutherland, Spencer, Walters, Waldron, Woods. A special meeting of the Carlton F. C. held at the Clyde Hotel to arrange the annual concert and sports day. "The ground on the Flemington Hill is prettily situated, and being of considerable extent, the Essendon, which includes a number of fast runners, wisely takes the advantage which a large ground gives it, and makes the playing space the full size allowed-200 by 150 yards. Their ground is not enclosed, but as the number of onlookers, owing to it's distance from town, is usually small their encroachments rarely cause much inconvenience." In 1873, The Age said Essendon's ground was a large paddock near Newmarket railway station. Gardiner won the toss and kicked with the aid of a strong breeze. The home team played well, and much was expected from them in the second half with the wind. However, the Blues were too strong. A disputed goal was awarded to Carlton when the ball struck the post and went through the goals. The Australasian said that the ball struck the post and bounced back into the field of play, where Carlton's Henry pick up the ball and put it through the goals. The umpire gave it as a goal. The paper says this was the correct decision as the ball hadn't gone through for a behind. The Football Association clarified this rule on August 11. Barrass, Bracken, Coulthard, Ford, Goer, Gunn, Gardiner, Henry, J. Kelly, Murphy, Melville, Nudd, Rickards, G. Robertson, James Robertson, Smith, Sidley, Turnbull, Waldron, White. Best; Coulthard, Murphy, Melville, Gardiner, G. Robertson. Players mentioned; (9) Gardiner, G. Robertson, Coulthard, Henry, Gunn, Murphy, Barrass, James Robertson, Melville. Carlton Reserves played Albert Park Reserves at Albert Park. Players met at the Athletic Club Hotel at 2pm. "That the ball striking either the goal or kick-off posts should be considered a behind goal." The Melbourne City Council resolved that the permission for the Carlton F. C. to occupy six acres of land in Princes Park be rescinded. They proposed to level areas of both Princes and Fawkner Parks, plant grasses, keep cattle off them, and be for the use of athletic games. Hotham played West Melbourne on the Madeline Street ground. Carlton secretary J. R. Turnbull wrote to the editor of the Australasian. Carlton played a Williamstown (25) at the Gardens Reserve, Williamstown. The news that Carlton were coming to the fishing village created a lot of excitement. 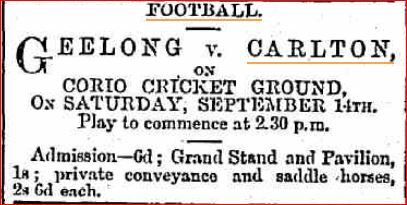 The Williamstown Chronicle; "As this is the first occasion on which the Carlton club have paid a visit to Williamstown, and as the local club will be put to some expense in inviting them down a charge of sixpence for admission to the ground will be made." The Chronicle's reporter said of the ground, "if it were 50 yards wider and as much longer it there wouldn't be a finer plot for football in the colony." Carlton kicked with the wind towards the railway end. The home side played well in the early stages of the first half, then Coulthard and Murphy exerted their influences on the match. "... Henry, of Carlton, availing himself to one of those nice little marks which they know so well how to give, made a try at goal from the side, and got it. First goal to Carlton." The Blues were playing as a well organised team, with their use of "little marks" in particular. Whereas the local men were playing as individuals. After half time the wind advantage had dropped, but Williamstown again played well and scored their only goal. The Blues then pressured the opposition and scored through a Rickards place-kicked goal, and then Henry's kick was stopped on the goal line. After the match the Carlton team was entertained at Scudder's Hotel. Barrass, Bracken, Coulthard, Ford, Gunn, Goer, Gardiner, Henry, Kelly, Murphy, Melville, Nudd, Robertson, Robertson, Rickards, Rickards, Smith, Turnbull, Waldron, White. Players mentioned; (9) Barrass, Coulthard, Gunn, Gardiner, Henry, Murphy, Jas. Rickards, George Robertson, Waldron. Carlton Reserves played Essendon Reserves at Essendon. Melbourne played the Adelaide team, The Victorians, on the M.C.G. Carlton champion George Coulthard umpired the match, and "made an excellent field umpire." The M.C.C. 's reversible grandstand was packed. The match got underway at 3.20pm. with Gardiner kicking off to the western goal. The Blues kicked themselves out of the match. They were the better side for 75% of the day, but the forwards let them down. They missed at least three very gettable goals. Melbourne hardly had the ball on their forward line, but they made the most of it when they did. £40 was raised and donated to George McGill who broke his leg in the match against Waratah. Barrass, Bracken, Coulthard, Ford, Gardiner (Capt. ), Guy, Goer, Gunn, Henry, J. Kelly, Murphy, Melville, Nudd, G. Robertson, James Robertson, Jas. Rickards, Smith, Sidley, Turnbull, Waldron. Best; Coulthard, Goer, G. Robertson, James Robertson, Nudd, Gardiner, Smith, Gunn, and Sidley. Players mentioned; (18) Gardiner, Coulthard, Smith, Bracken, Henry, James Robertson, Turnbull A. E. 'Topsy' Waldron, Goer, Murphy, George Robertson, Barrass, Gunn, Guy, Nudd, Sidley, Kelly, Melville. "The Melbourne footballers did a graceful act last Saturday. At half time in the match between them and their old antagonists, the Carltonians. They dispersed themselves amongst the crowd, and took up a collection for the benefit of George McGill, the injured captain of the Carlton First Twenty. I rejoice to learn that their efforts met with the very substantial success of between £40 and £50." Carlton played St. Kilda at St. Kilda. A completely one side match, St. Kilda did not threaten to score. Many of the St. Kilda players failed to show and substitutes were used. Brendell, Barrass, Bracken, Coulthard, Ford, Gardiner, Goer, Gunn, Guy, Henry, J. Kelly, Melville, Nash, Nudd, G. Robertson, James Robertson, Rickards, Smith, Turnbull and Waldron*. Goals; John Rickards 2, Coulhard, Murphy, Smith, Goer. Players mentioned; (7) Gardiner, J. Rickards, Murphy, Coulthard, Goer, Smith, G. Robertson. The Carlton Reserves played Melbourne Reserves on the Melbourne ground. The report mentioned that one of the Carlton Reserves' players was Waldron* of the first twenty. On The Blues' former home ground at Madeline Street, Hotham played Albert Park. Carlton played a South Yarra Standard and Fawkner Park Club Combine 25 at Royal Park. Edward Coventry captained the juniors, and along with his brother Alick Coventry, were better players for the opposition. Both Coventrys would become Carlton players in the future. The crowd was well behaved and did not encroach onto the ground. Gardiner lost the toss and kicked off into the wind to the eastern goal. Barrass, Bracken, Coulthard, Ford, Gardiner (Capt. ), Goer, Gunn, Guy, Henry, Kelly, Murphy, Melville, Nudd, Robertson, Robertson, Rickards, Rickards, Smith, Turnbull, Waldron. Goals; John Rickards 2, Coulthard, Goer, Gardiner/Henry (The Leader named Henry as a goal kicker). Players mentioned; (12) Gardiner, Coulthard, Waldron, John Rickards, Goer, Henry, Melville, Nudd, J. Robertson, George Robertson, Smith and Murphy. Carlton Reserves played Star of Carlton 25 at Royal Park. Turnbull, J. Henry, and Gunn could not play and replacements had to be found. Geelong won the toss and kicked with a strong north-west wind. The home side took full advantage of the wind, and scored three goals in the first fifteen minutes. In the second half the wind was more gusty and steadied in the last thirty minutes. Geelong played the better football throughout. Both Carlton and Melbourne were defeated on this day. "How the mighty have fallen! The Melbourne and Carlton, the clubs par excellence for years past, the wonder and admiration of the public, the reverenced of outside players, who stood afar off, "and cast a wistful eye" towards their ranks, actually defeated in one fell day, the one by a comparative youngster, the West Melbourne, and the other by Geelong. Shades of Harrison and Conway avert your gaze, for such a thing was never chronicled in the annals of the reds and the blues. Melbourne and Carlton both beaten in one afternoon." Barrass, Bracken, Coulthard, Ford, Gardiner, Goer, Gunn, Guy, Henry, Kelly, Murphy, Melville, Nudd, Robertson, Robertson, Rickards, Rickards, Smith, Turnbull, A. Waldron. Emergencies; G. Bell, H. Waldron. Players mentioned; (10) G. Coulthard, J. Gardiner, H. Waldron, Donovan, Barrass, Kelly, Rickards, John Rickards, Nudd, George Robertson. Carlton Second Twenty/Reserves played Lincoln United in Royal Park. Carlton F. C. Annual Concert and Ball held at Hockin's Rooms Elizabeth Street, 7.30pm. The concert was well attended, the hall being crowded. After an excellent ballad concert, Mr. George H. Ievers amused the audience with his song "Forward Carlton," sung to the tune of "Many Happy Returns of the Day," about principal Carlton players. Two hours of dancing followed the concert. Carlton played a South Melbourne (25) at Royal Park. The Blues fielded a rather weak team against South Melbourne. Bracken, Guy, Gunn, Murphy, and James Robertson did not play. The juniors kicking with the wind, were too good for the Blues in the first half. South had to battle against the wind to hold Carlton out, which they did until 10 minutes before the bell when Ford kicked the equaliser. The Blues' Henry then put another through, but the goal was disallowed. Barrass, Bell, Bracken, G. Coulthard, Ford, Goer, J. Gardiner, Henry, Kelly, Melville, Murphy, Nudd, G. Robertson, J. Robertson, Rickards, Rickards, Smith, Turnbull, Waldron, Waldron. Players mentioned; (6) Ford, Henry, Coulthard, George Robertson, Smith, Waldron. Carlton Second Twenty were fixtured to play Carlton United at Royal Park. A large crowd of around 10,000. A fine and unusally warm day. "Never in the history of the meetings of these old rivals was so much interest evinced or such enthusiasm displayed as of last Saturday, and the old trysting ground never mustered such a multitude nor looked more brilliant. The grandstand, with its densely packed array of style and fashion; the bustling and more robust throng who crowded every spot of vantage round the fence; the more sober and sedate, who preferred the promenade or back row, and those who had wandered towards the hill at the rear of the western goal - all completed a spectacle at once picturesque and stirring. The afternoon was glorious, old Sol shone out brightly, and gentle, almost passive, zephyrs ever and anon wafted their genial influence o'er the scene "to cool the heated brow, and fan the cheek of beauty." Once again the Carlton forwards were off target and Melbourne made the most of their chances. The Blues should have had 6 or 7 goals by half time. At the start of the second half Coulthard (twice), Bracken, and James Rickards all missed easy chances within 40 yards of the goals. Just after half time Waldron had a dispute with Carlton captain Gardiner and walked off the field, leaving the Blues with 19 men. There was some rough play which the VFA is going to investigate. Barrass, Bracken, Coulthard, Ford, Gardiner, Goer, Guy, Henry, J. Kelly, Murphy, Melville, Nudd, G. Robertson, James Robertson, James Rickards, John Rickards, Smith, Turnbull, Waldron, Waldron. Players mentioned; (20) Goer, J. Kelly, Turnbull, Barrass, James Robertson, Waldron, Ford, Coulthard, Bracken, James Rickards, Nudd, Gardiner, G. Robertson, Melville, John Rickards, Turnbull, Henry, Waldron, Murphy, Guy. Best; George Robertson, Coulthard, Barrass, Gardiner, James Rickards, Turnbull, Guy, James Robertson, Goer and Waldron. Played 24, Won 17, Lost 5, Drawn 2, Goals Won 70, Goals Lost 23. Goals: G. Coulthard 18, J. Henry 14, John Rickards 10, J. Gardiner 4, W. Goer 4, B. Murphy 3, G. Smith 3, L. J. Bracken 2, F. Gunn 2, Jas. Rickards 2, J. A. Turnbull 2, E. Barrass, A. Ford, T. Nash, H. Nudd, G. Robertson, and J. Sutherland 1 each. Played 12, Won 3, Lost 6, Drawn 3, Goals Won 10, Goals Lost 13. Goals: T. Knowles 6, Wishart, Browne, Long, Lewis 1 each. Two Waldrons named in the team. (August 31, Waldron named in side to play St.Kilda. Blueseum has an Arthur Waldron listed, but for 1889. H. Waldron is mentioned in a report on the Geelong match on September 14 this year. Carlton Football Club Sports Day at the East Melbourne C.G. 1. J. Spencer, 2. J. Turnbull. 1. John A. Turnbull, 2. G. Coulthard, 3. J.H. Guy. Drop Kick - Grand Challenge Trophy - Open to all Senior Clubs. 1. G. Browning (West Melbourne) 60 yards 1 foot, 2. H. Nudd (Carlton) 59 yards 1 foot, 3. D. A. Rannard (West Melbourne) 53 yards. 1. J.H. Henry, 2. R. Donaldson, 3. R. Knowles. The Argus (p6) reporting on the Melbourne v Geelong match on Saturday printed the team line ups. George Coulthard was named first amongst three other players as best in the competition. "The play of Carlton throughout the season was equal to if not better than any metropolitan club, as the analysis will show. There was a weakness, however apparent in the forward division in important matches, which largely accounts for the results of these, the chances being altogether disproportionate to the goals actually scored. Coulthard and George Robertson-the latter much improved-played splendidly all through, and so did Gunn, Murphy and Goer, while George McGill showed very good form until his play was stopped by an accident, and George Smith and A. E. 'Topsy' Waldron are two of the best men in the team. Gardiner, James Robertson, the Rickardese, Henry, Nudd, Turnbull, Bracken, Melville and Guy have also contributed materially to the success of the club. Major goal kickers; Coulthard 15, Henry 13, John Rickards 10. Former original Blue, Tom Gorman crossed paths with Australia's most famous bushranger Ned Kelly. The Kelly Gang; Edward "Ned" Kelly, Daniel Kelly, Stephen Hart, & Joe Byrne robbed the Euroa National Bank of £1,646* on 11 December 1878. The web site www.kellygang.asn.au says that the Euroa station master that day was a Mr. Gorman. The Argus' report of the robbery 12 December 1878 (p6) said the gang cut Euroa's only form of communication. They cut the telegraph wires which ran along side the railway line in two places. They were cut some miles from Euroa on the Melbourne side and about 100 ft of wire was removed from the Albury side of the town. Gorman was aware that the telegraph was not working and had sent repairmen to find the fault. They would be captured by the Kelly Gang. The National Bank was only 50 yards from the railway station. Just before the due closing time at 4pm, Tom took the day's takings of £80 to the National Bank and finding the doors closed he called out to the staff to open up. There was no sound from inside and Tom thought his watch must be faulty and he returned to the railway station. Little did Tom know that only a few inches behind the bank's door was the Kelly Gang with their revolvers drawn. After the robbery 14 hostages were taken mostly from the National Bank including the bank manger Mr. Scott and his family. They were driven in waggons and a buggy by the gang in full view of the unsuspecting town folk to Faithful's Creek some 5 miles away. At 8pm. the gang headed in the direction of Violet Town, the hostages at Faithful's Creek mangaged to free themselves. The bank raid took place mid afternoon, but it would be about 9.30pm that evening when Tom Gorman, who was at the local hotel helping to organise the Boxing Day sports meeting, was summoned to the railway station. "He shortly afterwards returned in an excited state, informing us that the Kellys had robbed the bank next door during the afternoon and had taken the Scott family and clerks out to Faithful's Creek." "The Kellys had, however, driven away the horses belonging to the two carts, and there was only Mrs. Scott's buggy left to take the whole party home. The women were therefore put in the buggy and driven back, while the men walked down the line to Euroa, and at once gave information to the authorities of what had occurred. Owing to the prompt action of Mr. Gorman, the station master at Euroa, the telegraph line was repaired and communication restored with Benalla very soon afterwards." "Nothing further was known by Mr. Gorman until a quarter to ten p.m. when one of the repairers who had been in custody informed him of the whole circumstances. Mr. Gorman at once sent a telegram to the Chief Commissioner of Police at Melbourne, and then proceeded to the police station and asked Constable Anderson to proceed to Benalla by the 4.40pm train to give full information." Tom Gorman would go on to become the station master at Hamilton. Less than two years after this close encounter with the Kelly's, in April of 1880, tragically, Tom and three of his children would die in a diphtheria epidemic that swept through the town of Hamilton. Ironically, in 1879 four young men in southern NSW decided to rob people and pretended to call themselves the "Kelly Gang," one of the bushrangers was a 21 year old named Thomas Gorman! In 1878 the Victorian and the New South Wales Government 's joint reward for the capture of the Kelly Gang was £8,000. A massive sum of cash when one considers the Economic Power of that amount of money in today's terms. The £8,000 Reward was paid out in full with Victoria Police Superintendent Hare receiving £900, Thomas Curnow £550, Senior Constable Kelly £377/11/6, Sergeant Steele £290, Constable Bracken £275 etc. June 23 1880, Thomas Curnow (1855 -1922) was one of the hostages held at the Glenrowan Hotel. He had over heard two gang members discussing the derailment plan. Curnow manged to escape while pocketing a candle. Curnow headed for the railway line which the Kelly Gang had removed a rail on a curve.The night train carried a detachment of Victoria Police being sent from Melbourne to Glenrowan. Curnow managed to flag down the train using the lit candle held behind a piece of red cloth. Curnow saved the train and its occupants from disaster. The police then headed for Glenrowan which led to the shoot-out and the deliberate burning of the Glenrowan Hotel. Ned Kelly suited in armour appeared out of the scrub firing his rifle and then revolver at the police. He was wounded and captured. He had faced the full onslaught of police pistols and rifles. The other three gang members died in the burnt out hotel. After his trial, Ned Kelly was hanged at the Melbourne Gaol on November 11 1880. The Carlton Story. Hugh Buggy and Harry Bell. Pages43, 44, 45, 259. The History of the Carlton Football Club. B. Hansen pages, 39,40. A Colonial Experience. Geoffery Manning. Origins of Australian Football, Vol 2. The Weekly Times, 1878 editions. Contributors to this page: blueycarlton , Jarusa , pblue , molsey , nikki and admin . Page last modified on Friday 31 of August, 2018 09:32:44 AEST by blueycarlton. 1998 - Blues finally snare Sean Charles.